As the diocese of Pueblo hasn't bothered to update its website yet (...that's the spirit...), the rollout resources for today's appointment of Fr Fernando Isern as the Colorado diocese's next head come courtesy of the archdiocese of Miami, where the 51 year-old appointee served until this morning's news. The first Cuban-born prelate to head a Stateside diocese since the Jesuit Enrique San Pedro of Brownsville died in 1994, Isern (right) will be ordained and installed on 10 December in Pueblo's Cathedral of the Sacred Heart. Our Holy Father, Pope Benedict XVI, has entrusted me with the care of the people of the Diocese of Pueblo. We commend ourselves to his prayers. I wish to thank His Excellency Arthur Tafoya, for his many years of exemplary service to the Diocese of Pueblo and for his warm and fraternal welcome to me. 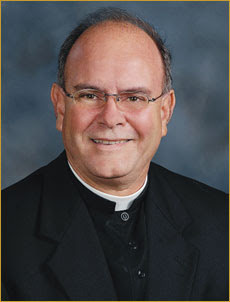 I thank Archbishop Favalora, his Auxiliaries, priests and religious for their example and fraternity during my years as a priest of the Archdiocese of Miami. I am especially grateful for having been entrusted as pastor of Our Lady of Lourdes parish. I have been able to experience the wonderful vibrancy and love of this Archdiocese in the commitment of its laity. As President of Archbishop Coleman Carroll High School and Our Lady of Lourdes Elementary School, I have seen the wonderful contribution that Catholic education makes to the Church. The love of Christ has urged us in a variety of other ways and ministries in the Church, for example, detention ministry and I have, therefore, adopted the Episcopal motto, “Caritas Christi Urget Nos” (2 Cor 5, 14). Bishop-elect Fernando Isern is new to the Rocky Mountain west, but he comes with the enthusiastic support of the many laypeople and bishops, in Florida and elsewhere, who know the excellent quality of his priestly service. He has an outstanding record of leadership as a pastor, a devotion to prison ministry and advocacy for the unborn child and the poor, strong personal roots in the Latino community, and a demonstrated ability to work with persons of many different ethnic and social backgrounds. Bishop Arthur Tafoya has served the Church in the Diocese of Pueblo in a distinguished way for many years. He will be greatly missed as a brother and leader as he begins a well-earned retirement. But he can take joy and confidence – as we do – in the character of the man who now takes up his duties. As of this writing, the only other info posted on any of the three relevant chancery sites is the Duluth diocese's standard-fare release announcing the appointment of Bishop-elect Paul Sirba.